The all new 2017 Ram truck has the best performance towing capacity in the industry. Performance. Efficiency. Intelligence. That’s strength evolved. Nowhere is it more evident than with the legendary towing and hauling capability of the Ram 1500. Smart engineering such as the available Class-Exclusive Active-Level Four Corner Air Suspension or Ram’s standard Class-Exclusive TorqueFlite eight-speed automatic transmission means there isn’t much the Ram 1500 Can’t do. In conjunction with Ram Truck 1500’s performance towing, it has 3 available engine types. Leads the lineup in hauling capability and strength. One of the most advanced light-duty truck engines ever built. Power and efficiency comes standard. Moving forward, a heavy load can make it hard to get moving forward. Especially when you’re on a hill. Now, with Ram Truck’s Hill Start Assist, you can detect when your truck is on an incline. The system maintains brake pressure as you move your foot from the brake to the accelerator, so your truck won’t roll backwards. 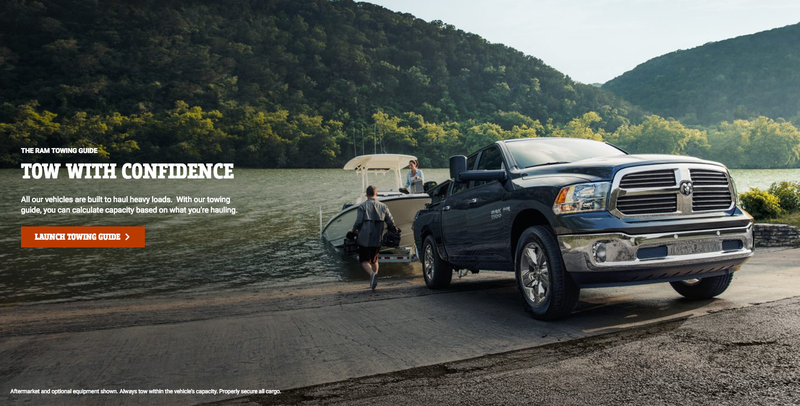 In addition to the Hill Start Assist, Ram trucks are equipped with an integrated trailer hitch that seamlessly connects the truck frame to your trailer. This helps provide a safe and secure connection. Ram trucks also feature a four- and seven-pin trailer hitch wiring harness and connectors with convenient bumper integration. Lastly, Trailer Sway Control recognizes a swaying trailer and automatically applies individual wheel brakes and/or reduces engine power to help eliminate trailer sway. Camping season is among us and that means Campers, Boats, and ATV’s. It also means the agriculture community is busy hauling equipment, livestock and feed. For all of this to happen, one needs a durable and dependable truck to haul these items. Fortunately, Ram has you covered. Power you can rely on when you need it most. Not only durable, but hauling has never been easier with Ram’s Trailer hitch wiring harness and Trailer Sway Control. That said, time to load up and prep for your next ultimate camping experience. All in all, when it comes to towing capacities, no one does it better than Ram truck. That is why it is important for you to speak with one of our product specialists today. For your convenience, we have several different Ram trucks available here at Sorg Dodge. Continually check with us here at Sorg Dodge for monthly rebates and incentives. Whether you’re looking to tow big or small, Ram has you covered with their unique trucks. If you aren’t sure what cab and chassis is right for you, you will want to check out our previous blog: “Ram Trucks – 1500, 2500, 3500… What’s The Difference???“. More-so, that blog will teach you everything from bed length and cab size to chassis and engine performance for all Ram models.